This weekend I went to an extra special little festival at a top secret location… The Shanta Love Club. 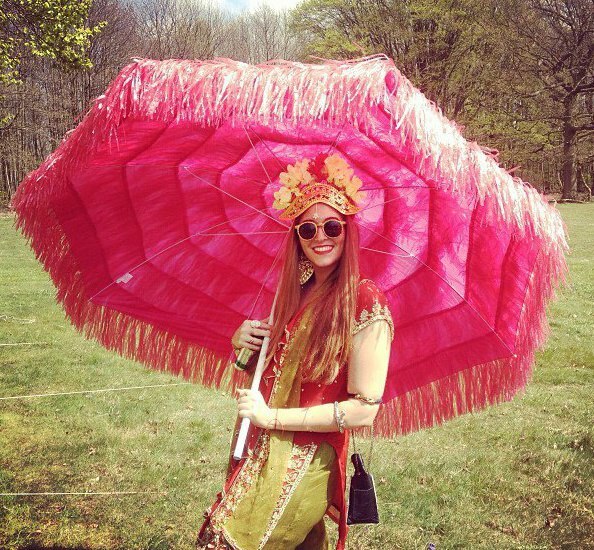 The theme was an Indian Summer so everybody donned embellished sari’s, doused ourselfs in jingling jewellery and were whisked off on coaches from Hackney to take us to a magical wonderland. Here’s a photo of me upon arrival, with my contribution to the setting of giant tropical umbrella. I’m wearing an embellished two piece with lots of gold jewellery, authentic ankle bells from India, a dainty tikka from Never Fully Dressed, a headdress I bought in Bali and the Bombay Dreams sunglasses from my range, Ooh La Lune. The festival was held in the woods and every little detail had been planned carefully from acoustic music in between the trees, to chill out bell tents, a giant stuffed tiger and DJs playing an array of party music. Luckily the sun was shining so it meant there was a lot of time spent lounging in the grass and fully enjoying the first glimpse of the British summertime. Perfect day full of laughter, colour, friends, bindis and sweet, sweet music.